Simon Woodham is a script editor. He writes original, commissioned and collaborative work as Joseph Miller. A long-standing collaboration with director Jamil Dehlavi (Born of Fire, Immaculate Conception, Jinnah) has resulted in three completed feature films – Infinite Justice, Godforsaken, and Seven Lucky Gods – and a short, Blood Money. Another feature is currently in development. 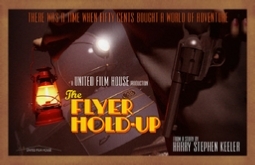 Simon’s screenplay The Flyer Hold-Up, loosely based on a novella by cult crime author Harry Stephen Keeler, is being developed by United Film House, with Kyle Gallner (The Haunting in Connecticut, American Sniper) and Virginia Madsen (Candyman, The Number 23) already cast. The director is Blake West. An original screenplay, Santiago Run, is under option to Zero Gravity Management in Los Angeles.